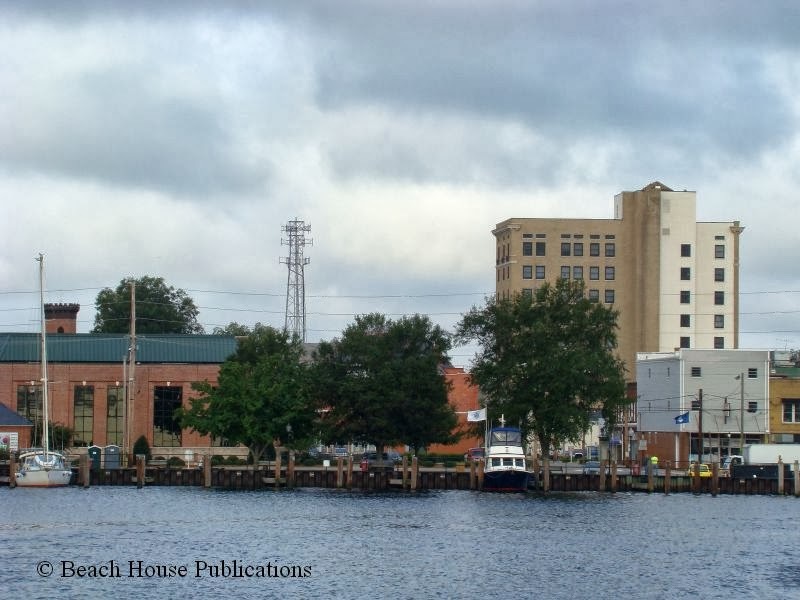 From a boater’s perspective, Edenton, North Carolina is one of those destinations you have to want to go to. 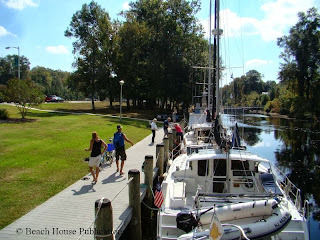 We left Elizabeth City and traveled some 15 miles down the Pasquotank River to the Albemarle Sound. The Albemarle is best known for its unpleasant conditions if the weather is not right. Under normal conditions, it’s no different than any other body of water we have transited. Once into the Albemarle from the Pasquotank, the trip is another 35 miles or more west to the entrance to Edenton harbor. 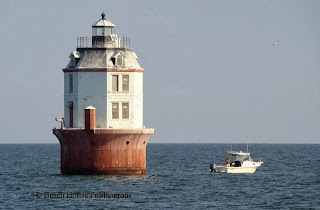 (It is more than 40 miles off the Virginia Cut route.) 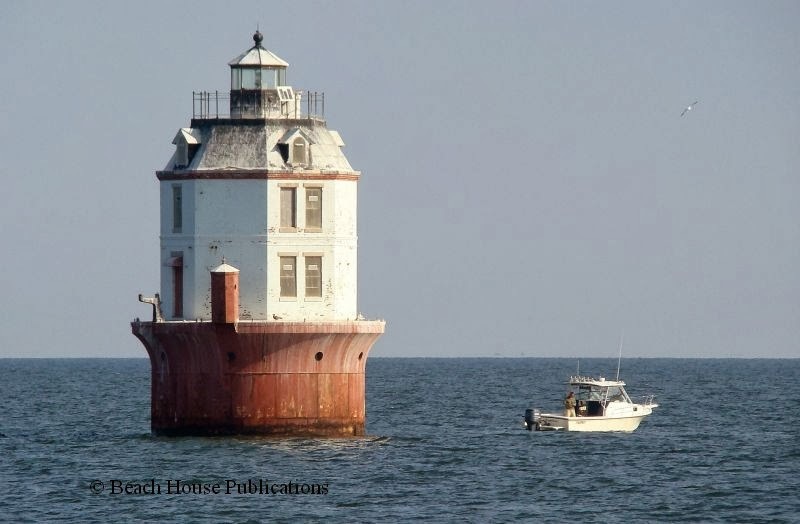 The water depths are fine for the entire trip, but do keep a sharp lookout for the many commercial floats marking traps that can extend far out into the Sound. It's like deja vu all over again. 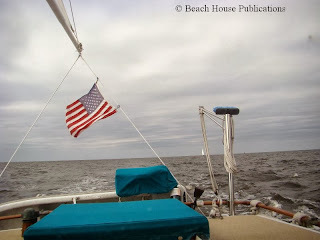 On the trip north, we had to deal with wet weather for weeks until we were in the Chesapeake, and now that we're out of the Chesapeake, the wet weather has settled in again with a vengeance. After four days, the rains did relent and although it was still cloudy, cool and damp, we departed the Dismal Swamp Welcome Center and headed downstream to Elizabeth City. Locking through at South Mills was easy and there was only a large catamaran that locked through with us. As we exited the lock, once again, we were in for an unwanted surprise. We have posted many, many more photos along our cruising routes, including free docks and anchorages along the way and important information on waterway conditions, on our Facebook page. Drop by and see what's new and where we're currently located. Hit the "Like" button to stay updated. Also, let us know what else you would like to see on the page. It's always with mixed feelings that we say so long to one of our favorite cruising destinations. There is sadness in knowing that we will miss some locations that time did not allow for. Sadness to say so long to our friends and family that we won't see again for many months. We will miss revisiting the many spectacular anchorages we enjoyed. But there is also a bit of joy in the anticipation of being underway again and transiting the Atlantic Intracoastal Waterway. 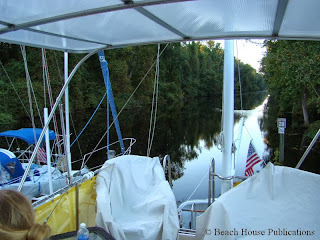 Even though we have done the ICW many times, each new cruise is different from the last. You just never get tired of it. At least we don't. There will be new towns to visit, favorite anchorages to enjoy and most important, meeting new friends and faces along the way. For us, that's the best part of cruising. For now, we just needed to finish getting down the Chesapeake. And the winds in the lower Bay were finally subsiding.